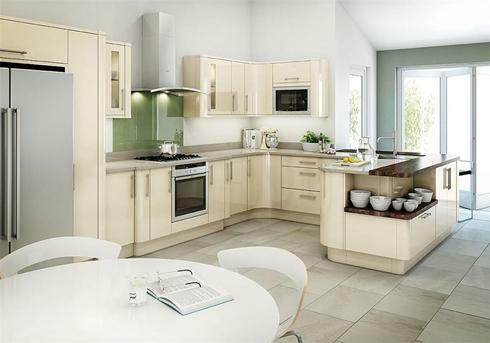 With a choice of six colours and several styling options, including glazed, curved wall units and curved doors, Newark lets you create a kitchen that's personal to you. If you prefer neutral tones, there's ivory, alabaster, beige, and white. For a bolder finish, choose ebony, black. A U-shaped layout is very space-efficient and provides plenty of preparation and storage space, while retro-inspired curves improve your kitchen's flow and ergonomics. Clever, pull-out storage makes the most of every inch and keeps key items right where you need them. Mixing quartz and timber worktops helps differentiate between cooking and sociable areas.